1 of 3 In a bowl, whisk vinegar, mustard, salt and pepper. Gradually whisk in the olive oil until dressing is emulsified. Whisk in parsley, oregano and thyme. Place 1/4 cup of the dressing in a large resealable plastic food storage bag and add the chicken. Shake to completely coat the chicken. Refrigerate for 2 to 3 hours. 2 of 3 Heat oven to 400 degrees F. Place chicken in a baking dish and bake at 400 degrees F for 30 minutes or until internal temperature reaches 160 degrees F on an instant-read thermometer. Broil for 3 minutes to brown top, if desired. 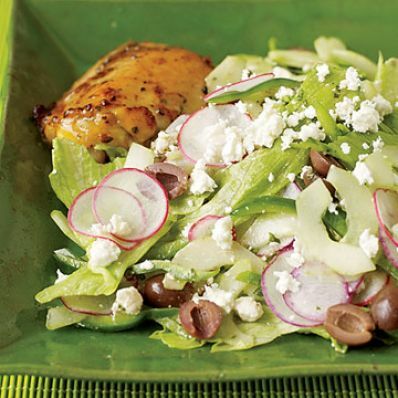 3 of 3 In a large bowl, toss together lettuce, cucumber, red onion, pepper, radishes, olives and crumbled feta. Toss with the remaining dressing. Serve salad alongside the chicken. Or cut the chicken in strips and toss with salad. Per Serving: 4 g fiber, 672 mg sodium, 26 g pro., 12 g carb., 397 kcal cal., 7 g sat. fat, 29 g Fat, total, 116 mg chol.